Another Velo-city first? Man flirting with differential axle. Well you had to be there. I was just checking through my photographs for a few final shots when I came across a short sequence which caught me by surprise. Officially this was a session where author Carlton Reid was expanding on his recent book and suggesting that without bicycles the car industry as we know it today would not exist. To help illustrate the point he brought a prop, which he shared with moderator Connie Czymoch. All perfectly fine, but the body language in the photos just took it down a whole different line. At some point the video will be streamed. Then you can check whether the words are exactly as I remember them. Regular readers will recall my book review for “Along the Med on a bike called Reggie” by cycling traveller and write Andrew Sykes. 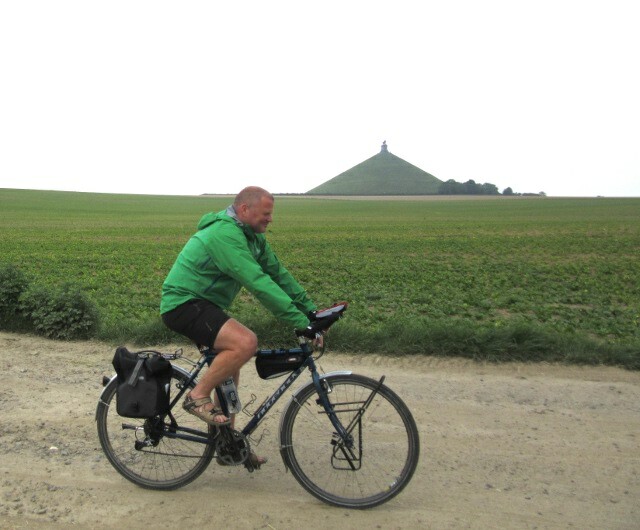 I am delighted to say that we have had a chance to meet up because Andrew is passing through Belgium on his latest ride as he heads from the south of Spain to the very North Cape of Norway. That’s about 7,000 km by the way, one hell of a trip. Planning the meet up has been interesting because it has made me watch Andrew’s Twitter feed and daily postings on www.cyclingeurope.org quite closely and by doing so I feel I am watching his next book write itself in front of my eyes, whether it be the never-ending saga of the lost sunglasses or a detailed commentary on French Atlantic Coast cycle routes. I feel a bit of responsibility here. 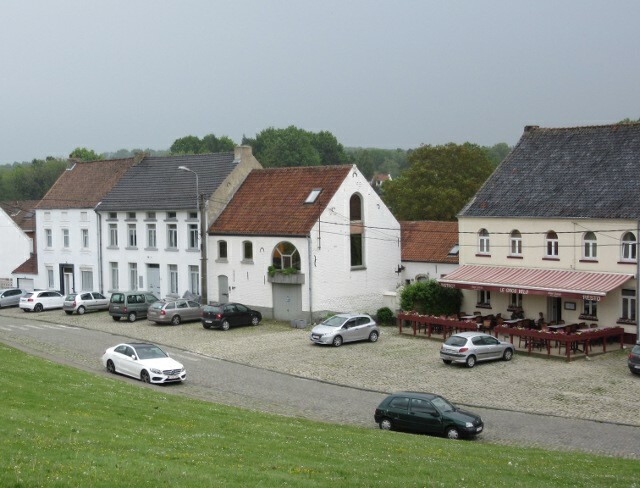 I have somehow become “Belgian expert” for this part of the route, a big ask for someone with just three years in the country. And I am guilty of encouraging Andrew to divert off his planned EuroVelo routes through the south of the country and further in to the centre nearer to Brussels and Flanders to be our guest in Lasne. If it doesn’t turn out well my EuroVelo colleagues in the ECF office will kill me for spoiling part of their publicity. Last but not least he is a “proper” author, print and pages and Amazon listings and all that stuff. On the internet we may be a bit ephemeral and a rude remark on Twitter can be laughed off. However I am a bit old school and I like my books to last. 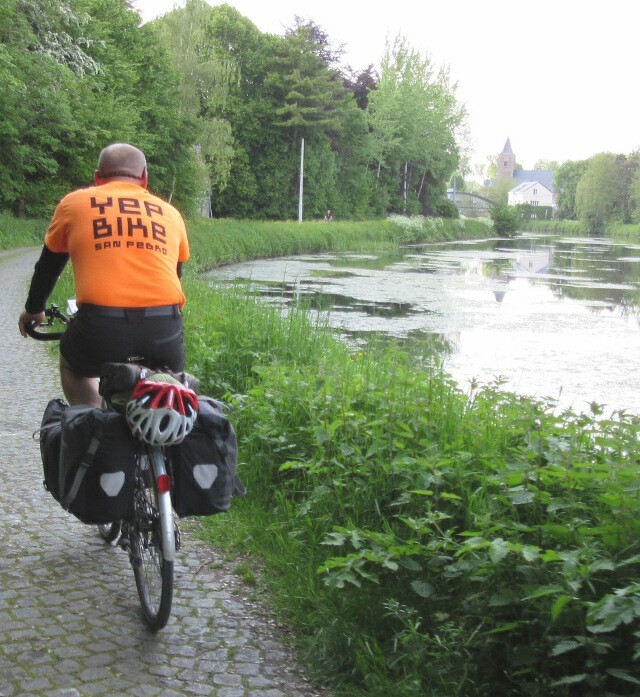 Somewhere in the deep recesses of my mind I am worried I might feature forever in print as “the man whose instructions sent me cycling into a canal” instead of some nice words about the Belgian countryside. Anyway, so far so good. 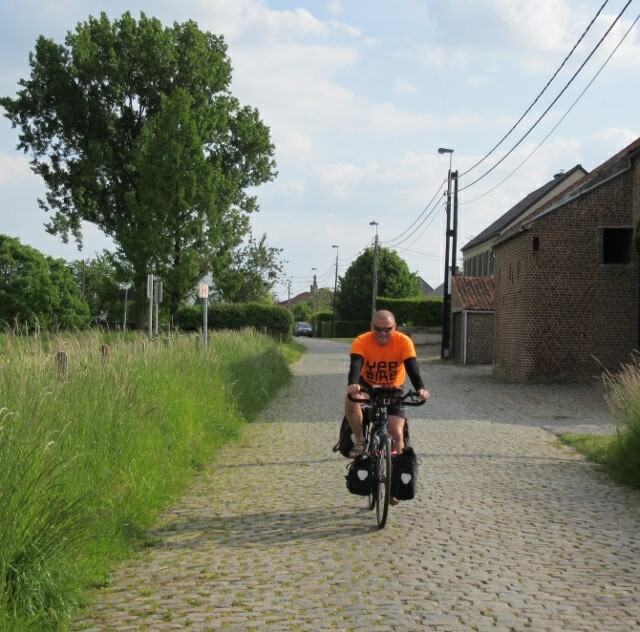 A few hours ago I left Andrew in Leuven plotting a route east towards the Netherlands and Germany following roughly the route I did with my Dad last summer. 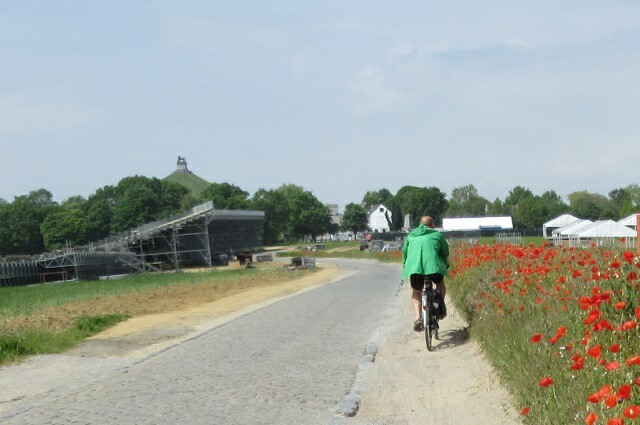 Prior to that we have had three good days cycling and sightseeing together with the Belgian countryside and indeed the weather doing us proud. On Friday Andrew’s arrival over the border from France was a good excuse to take an afternoon off work so I could meet him part way guide him though some of the interesting routes through Wallonia using mostly the Ravel cycle network of canal towpaths and converted railway lines. 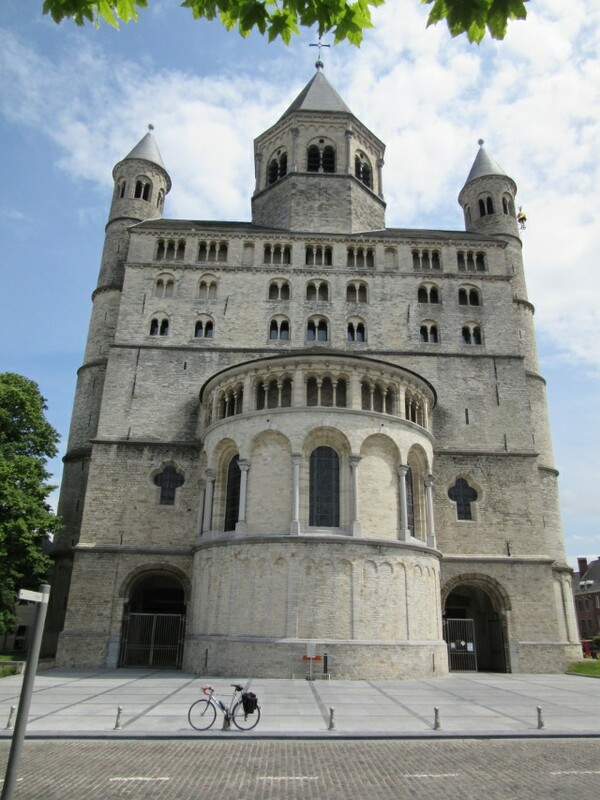 I took the train to the old Roman city of Nivelles where I took a ceremonial photo of my bike being dwarfed by the imposing west face of the church of Saint Gertrude. 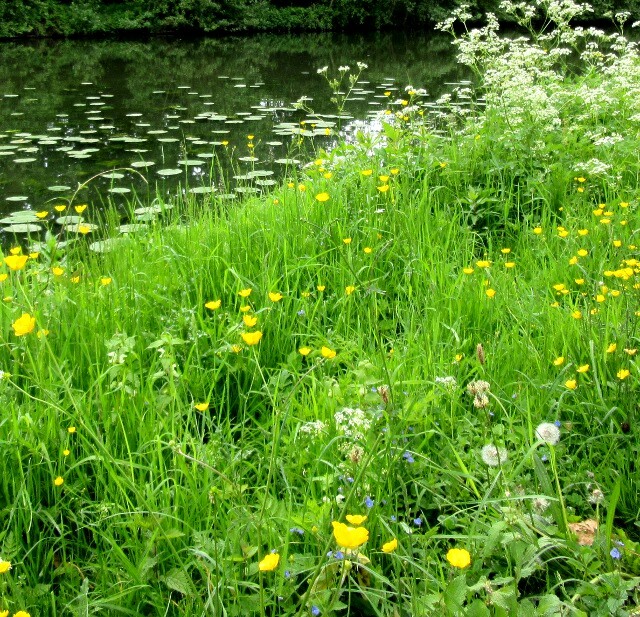 I then had a lovely ride down the route I planned for Andrew enjoying the wild flowers, birdsong and warm sunshine on the traffic free routes that took me swiftly south, firstly on the old rail line of Ravel 141 and then the old Brussels Charleroi canal, Ravel 3. 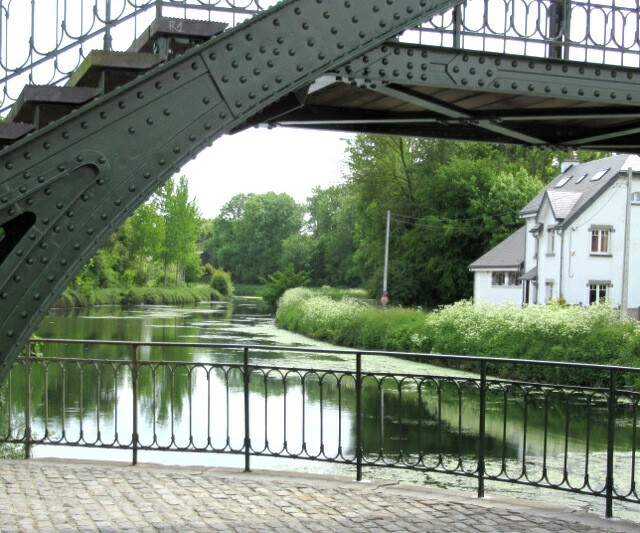 Our meeting point was La Louviere, crossing point of a number of routes due to its extensive canal network. Not a town I knew at all because it doesn’t feature in any guide books, When I approached the town past the steel works I realised why, because these canals were first and foremost industrial corridors and La Louviere was clearly a solid working town, struggling like much of Wallonia with the decline of historic industries. The town is trying very hard to spark itself up and I thought I could not have picked a better meeting point in the town square which was full of “animations”. Landmark? 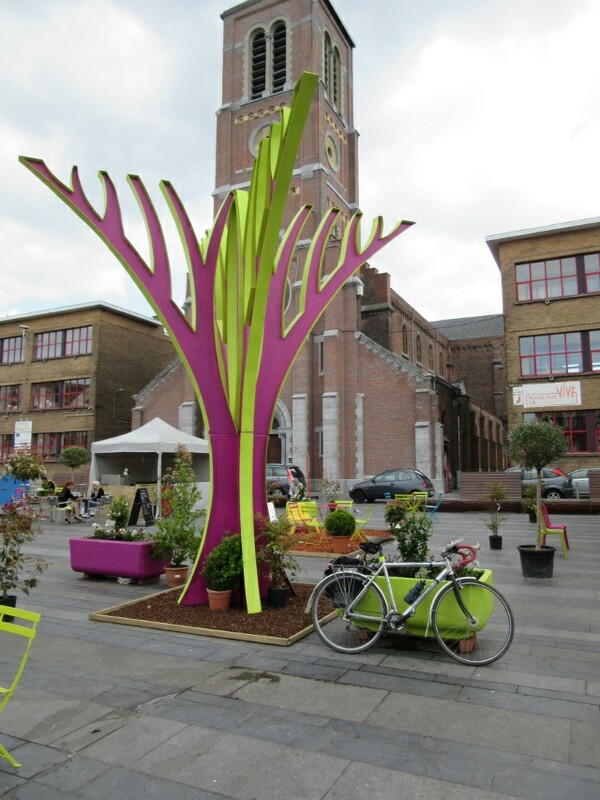 There can only be one purple and yellow tree in La Louviere surely. That didn’t quite work out because La Louviere has a few satellite suburbs that have their own squares and for a while we were missing each other completely. Eventually a rendezvous was made so we could have a very enjoyable summer afternoon ride back to Lasne. Last time I was here was the 5th of January when it was gloomy and so cold the canal surfaces were partly frozen, today was like another world. Yesterday is going to lead another blog post or two because we took a sightseeing diversion up to Waterloo, the most famous tourist attraction of the area. I am going to write about it separately because the 200th Anniversary is just a few weeks away and work is flat out in preparation for the events to mark the occasion. The existing Waterloo tourist area was frankly a bit of an international disgrace, run down and unappealing so I haven’t written about it much. However the new visitor centre was opened just a few days ago and it is a transformation, worth a write up in its own right. It was also an excuse for an hour or so gentle cycling to and from the battlefield through some of my local favourite routes. I am often very, very scathing about Walloon customer service so a special shout out to the landlady of “Le Gros Velo” the wonderfully named bar-restaurant in Plancenoit who knocked us up a couple of bowls of spaghetti bolognese hours after the lunch service was officially over, supped in the tranquil square with a glass of Leffe. 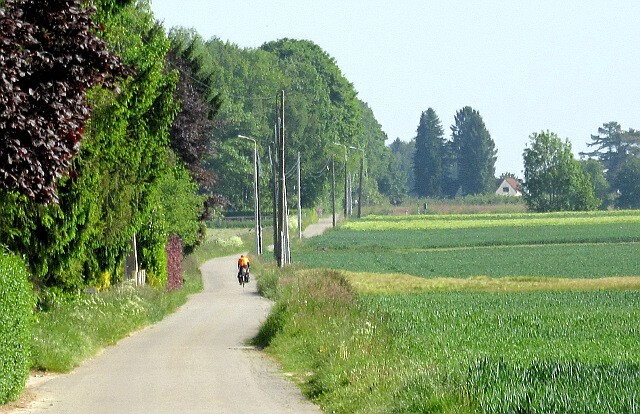 And today we sent him on his way with the ride up to Leuven, countryside full of sporty Flemish cyclists out on a Sunday spin on a public holiday weekend. None of them knew they were passing a man on a trip with 3,000 km done and still 4,000 to go, perhaps we should have demanded some respectful salutes. What else can I say? Well for those potential hosts further up Europe in the Warm Showers network I can tell you the Andrew you get in the books is very much the Andrew of real life. He is a very warm and engaging guest, full of chatty anecdotes and commentaries from his travels and teaching career. In particular I can see how the life of the traveling author suits him because he has an open mind and is curious about the countryside and cultures he is traveling though, much like a journalist as well as a writer. I admire that quality, it must sustain him. While I have secret hankering to set off on ride across a continent one day I find it almost impossible to imagine months on the road, I am very happy to be a reader of these travellers’ books and I am looking forward to Andrew and his bike Reggie reporting back after they get to the North Cape. 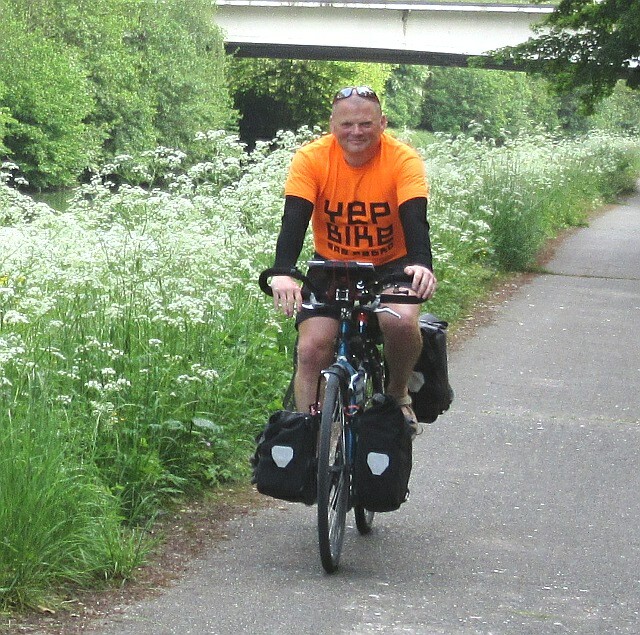 Andrew posts his reports daily on cyclingeurope.org so you can see his perspective on the visit as it unfurled too, with much more clever stuff like videos and commentary. I will be slightly nervous until they do arrive. Andrew told me he blames broken spokes on his very first trip on the cobbles he hit in Lille early on that journey. I must be getting a bit too accustomed to them because I just forget that many of my favourite routes have several sections of the horrible rattly stuff and my British guests are often distinctly discombobulated by bouncing around on the stones. I may just have passed over a few sections in my three days with Andrew and Reggie. They didn’t seem impressed. Having the bike laden with camping gear and everything you need for three months on the road just make it worse, so even if I didn’t end up as the man who sent the author into a canal I will be mightily relieved if I am not blamed for a wheel collapse, somewhere in northern Norway, three day’s ride from a bike shop. It’s the weekend – shed your monster! I’m going to, how about you? Wonderful stuff again from our friends at People for Bikes in the US. To be added to my cycling video library and shared with lots of friends. See you in the shed. My Dad moved house towards the end of last year which caused me a bit of a crisis. Nope, nothing to do with the man or the move. But as he was “downsizing” he told me was clearing out some bike stuff, his old maps and some of his bike books. I cannot imagine losing one of my books, in any shape or form, I keep them all. If you need a cycling guide to Belarus written in Russian I can oblige, not to mention a volume on cycling in Taiwan in Mandarin. I can’t read them, but they were given to me by fellow cyclists and I convince myself that on some occasion I can look at the pictures and daydream. Dad has accumulated a lot of stuff over the years and some of it is unique, and probably collectable. At minimum I would want it to go on Ebay so anyone with an interest can pick them off. However that’s not exactly Dad’s area of expertise and definitely not the thing to start when in the throes of a house move. In that situation the book collection was destined for the local charity shop where it probably wouldn’t sell and would end up in a skip. This was indeed a crisis. I made a dash over to Bungay a couple of weeks before his move was due and “saved” a part of the collection, in particular the books. We sat together and I worked through the pile until I had identified about 20 items that I felt were impossible to miss. It was a diverse selection. Firstly there were the recent books that I surprisingly had not accumulated myself or had read and passed on. 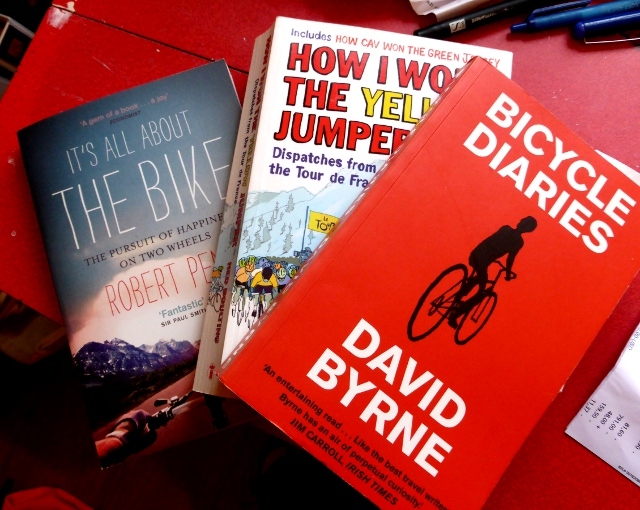 These included Ned Boulting’s entertaining “How I won the yellow jumper”, the bicycle passion of Rob Penn’s “It’s all about the bike”, David Byrne’s pedalling philosophy and wry observation in “Bicycle Diaries” and the book I think is the most best autobiography of a pro bike rider I have ever read, Laurent Fignon’s “We were young and carefree”. Then there were some absolute classics of their kind that are far too collectable to be dumped. 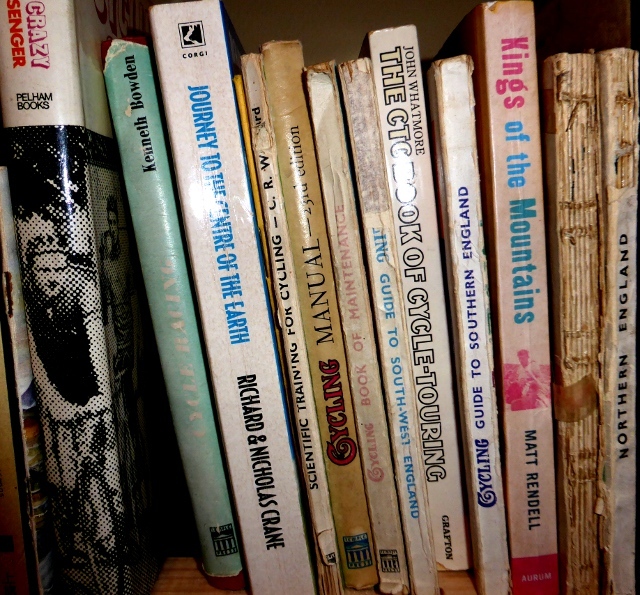 In particular there were several of the wonderful 1940s Harold Briercliffe touring guides to England which inspired a modern BBC TV series “Britain by Bike” by presenter Clare Balding and a reissue of the books, but these are originals. 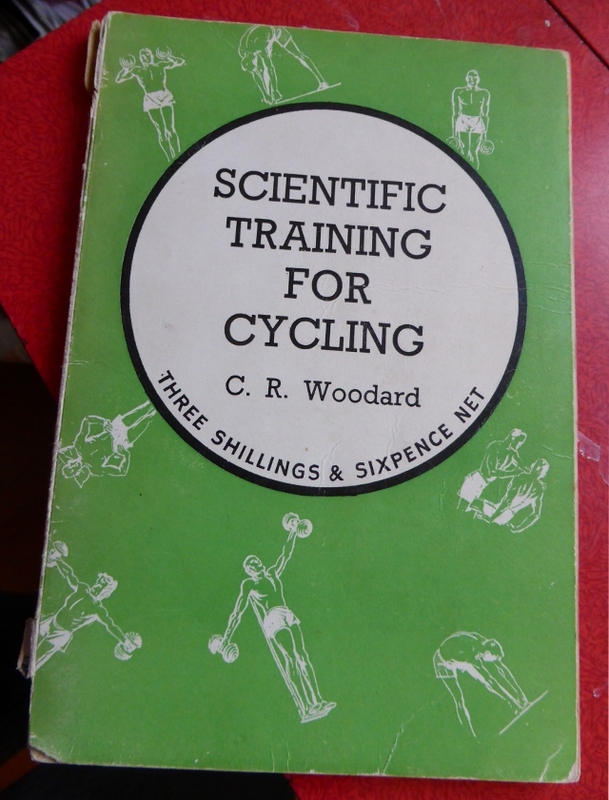 And who could not love a volume that is priced in proper old money, three shillings and sixpence, and features pictures of people doing “Scientific Cycle Training” with weights in gym clothes. Without their bikes? I bet that didn’t sell too many copies at the time. Collecting the books was fine until I got home and contemplated my own situation. 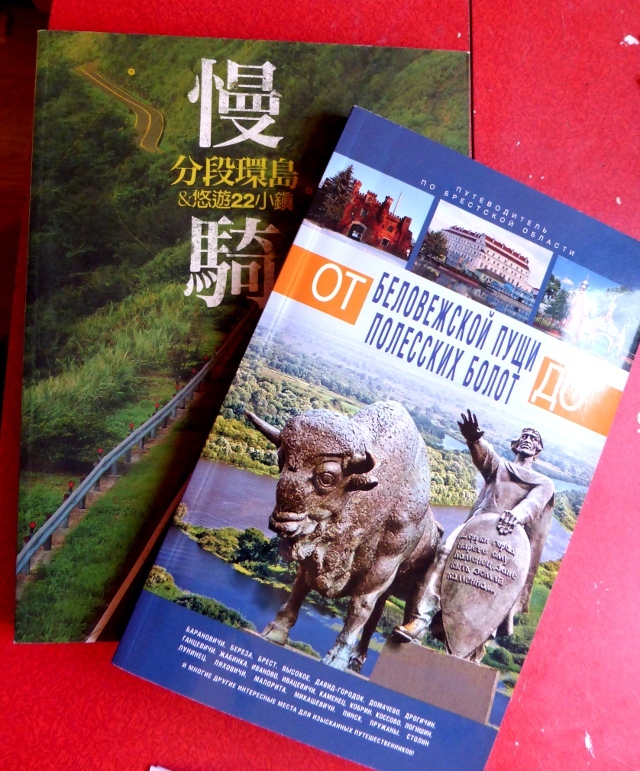 However doing a lot of cycling visits means that volumes like the guides to Belarus and Taiwan are not the only books I have picked up. I have accumulated a shelf overflow in the last couple of years that were piled all over the place. Together with the collection from Dad’s place it was time for an accompanying new bike book shelf. I was a bit surprised to discover that a quick tour round the house found another 20 volumes and the new shelf is itself almost full. Which leaves me the prospect that I either start accumulating e-books, or I have to find another 40 books to justify the next shelf. What would you do? Since I collected the books I have read and browsed a few of them. Here are two in particular that I have thoroughly enjoyed and are already inspiring thoughts for the blog. I mentioned this a couple of times in my recent blog posts about my own bike restoration project, so I won’t repeat the way the book helped me frame those posts. What I really liked about this book is the feeling of travelling with a kindred spirit, someone who cares quite a lot about bicycles, but cares far more about the spirit, passion and craftsmanship of the people who make the machines we might take for granted. This is writing about manufacturing as others write about art, his description of legendary builder Gravy lacing a wheel in California evokes the sense of a musician tuning the finest of violins. If you think this is about bike parts you have missed the point. If your affinity to cycling is a sort of urban cool then David Byrne could be your adopted high priest, as he is for many cycling advocates in the US. His band “Talking Heads” combined a really eclectic mix of musical influences from the mid 70s to the 1990s as well as making a concert film “Stop making sense” that highlighted their experimental styles. Byrne himself was the band’s lyricist and front man together with working in film, on the stage, producing World Music artists, painting, drawing and creating installation art. In the New York arts and music scene he can only be called a powerhouse. And all that time he was riding his bike, during a period when he was probably one of the very few cyclists in New York. Now he is feted for his commitment to the cause and was invited by the city to design some cycle parking stands that reflected places in the city including his dollar sign for Wall Street. Last year I discovered his lovely “Poem for Cyclists” which is a lovely short film connecting lots of cycling clips, I cannot watch it without smiling. That is the background to “Bicycle Diaries” from 2009 which is a collection of writings inspired by his bike rides around the world. To me it reads just like my favourite cycling diaries and blogs. It isn’t really about the cycling. It is full of the thoughts that actually go through his head while riding. Musings on society, urban development, architecture, transport, philosophy and culture flow from rides around various places in the US, London, Istanbul, Berlin and many other cities. Occasionally he comments on how bad a city like Istanbul can be for cycling, but clearly after New York he isn’t fazed by much so he is willing to ride everywhere. It is particularly fun to get his take on cities I have visited and see how he picks up feelings about the city from his bike too, so this book must rate as a particularly good addition to my new bookshelf, a and one I can see myself dipping in to for city writing ideas again and again. Those two make such a good start to the new collection. Many more reading days to come.